I ran a session for a group of Coaches recently looking in detail at Karl Rohnke’s Comfort, Stretch, Panic model. Its something we all knew of and the basic principles, but was really helpful to delve into it and ways in which it can be used. We use it to help determine the right type and level of challenge to set ourselves in order to nurture our own development. The Comfort Zone: your Comfort Zone is just that – comfortable – and includes everyday activities such as doing the same things and mixing with the same people. When most of your activities are in this zone life is, of course, ‘comfortable’ but you do not learn very much nor develop yourself – it’s simply more of the same and it can lead to the zone shrinking. The Stretch Zone: your Stretch Zone is the area of novelty, exploration and adventure. Here are the things that are a little or a lot out of the ordinary – the things you haven’t done for a long time or have never done before. This zone is not really a comfortable place – but it is a stimulating one. It is where we stretch and challenge ourselves mentally, emotionally or physically. 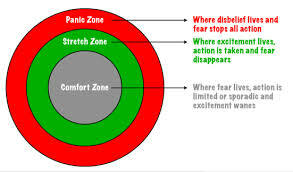 The Panic Zone: the Panic Zone is the area of things-to-be-avoided either because they are unacceptable to you or because they are currently a ‘stretch’ too far! This could range from things like public speaking at work, through to thinking about extreme sports on holiday. You may have activities in the Panic Zone which you wish were not there. Like all good models this is not just very simple, it recognises how un-useful it is to rigidly classify oneself or others. It takes into account how we are continually changing – how we are dynamic systems so what is ‘in’ a zone today might be in a different one tomorrow or in a month’s time. If I commit myself to a period of enthusiastic change I will extend my Comfort Zone. Yet if lots of unwelcome change is imposed on me by ‘circumstances’ I am likely to resist it, become risk averse and shrink my Comfort Zone. Now activities that a year ago I found enjoyable and stimulating are perceived as too threatening. And, once I begin shrinking my Comfort Zone, there is a real risk of the process becoming a way of life. Your personal health and well-being requires maintenance and you can use the Comfort Stretch Panic model as a useful simple-yet-powerful gauge of how you are doing and as a means of encouraging yourself to begin stretching in all senses of the word. You can have a set of zones for different areas in your life – health, fitness, family and social life, working life, career, etc.